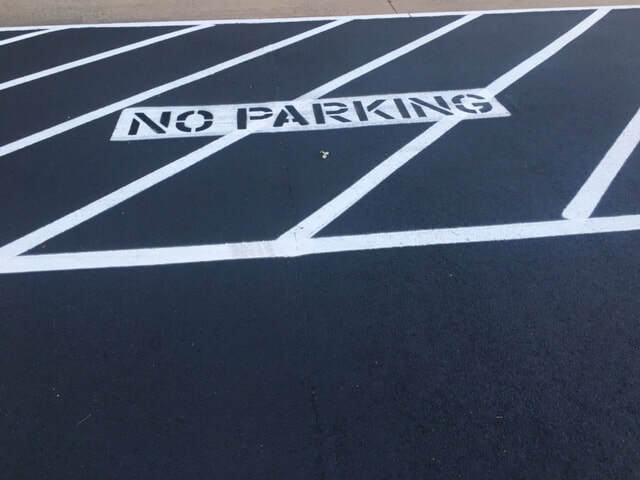 Parking lot striping is a great way to enhance the curb appeal and spruce up your property to make your business look fantastic in Oklahoma City. We know that in order to attract more customers in the Oklahoma City area your business needs to stand out among the others. 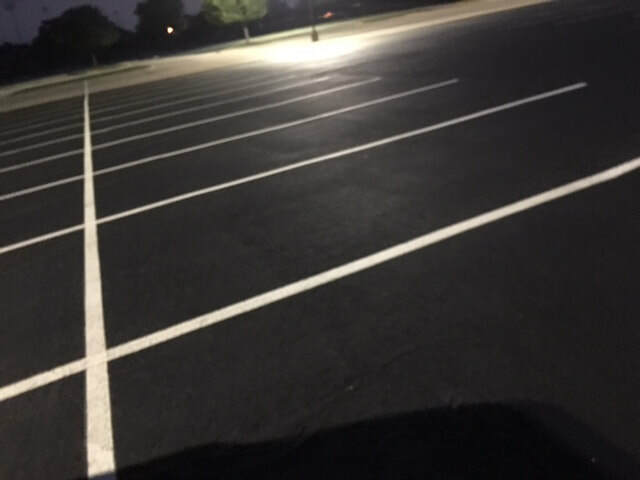 When your parking area is freshly painted, and the lines are crisp and clear your patrons will feel safe and realize you care about the appearance of your business. The hot Oklahoma summer sun and the winter snow can both do a number on painted surfaces so staying up with a normal maintenance schedule for your pavement striping needs will keep your business looking amazing all year long. As with any type of project, using the best materials and equipment will always help to produce great results. We only use the highest quality striping paint to ensure the best quality of adhesion, as well as appearance every single time. 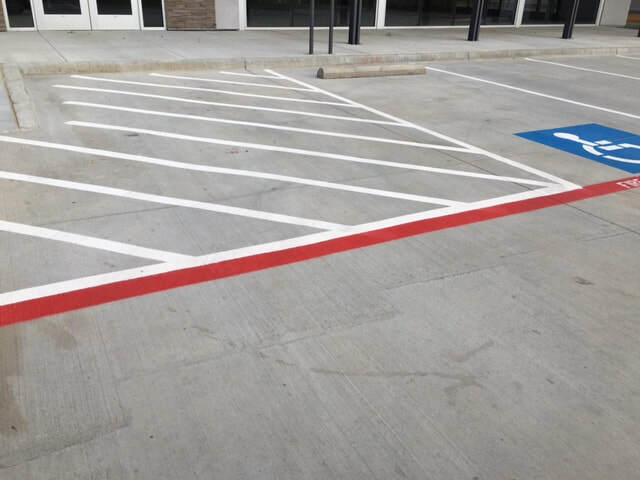 We pride ourselves on the ability to stripe the straightest parking lines in all of Oklahoma, and your business parking area will look amazing with the results we will produce for you. There is no job too small or too large for our crew, and we take pride in being your go-to parking lot striping company. We provide excellent customer service along with professional service allowing us to be known as the top striping company. We provide a full-service offering of all things related to your parking area. No matter what you need to have done, we are ready to assist. We service both concrete and asphalt parking lots. 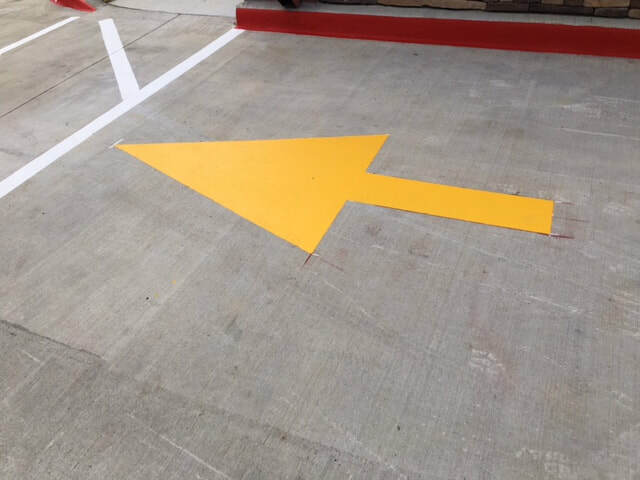 Our crews are fully trained, experienced, and knowledgeable about all things related to parking lot maintenance, and the quality of work we produce is evident of our experience. We will work with you or your project manager to schedule and ensure that we do not disrupt the normal flow of traffic for your business. If we need to work off-hours or weekends that is not a problem, as we have crews that can work all hours of the day and night. The good news is that we use such high-quality paint that it dries fast, and can be driving on literally within 10-15 minutes of applying to the surface. Here are many of the services we offer. If you do not see a specific service, just give us a call and we will most likely be able to assist. Local fire codes are put in place to keep everyone safe. Having proper fire lane striping when required is not an option. 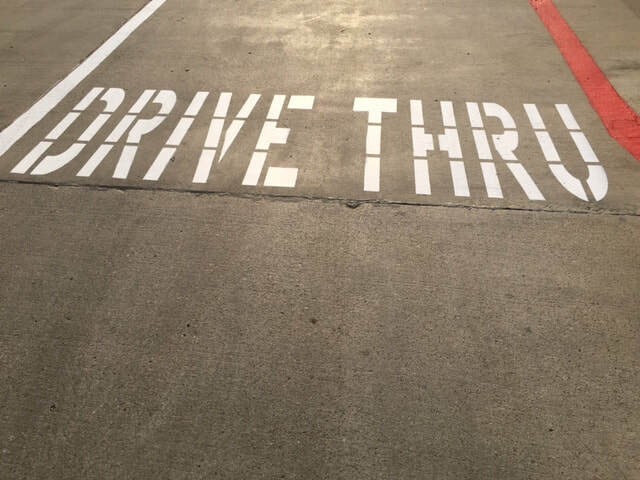 If your business is required to have the fire lane striping contact us right away. Our professionals will come out and provide the striping you need to keep your business in full compliance. Maintaining proper access to all emergency vehicles (Fire, Ambulance, and Police) is very important in the event of an emergency. 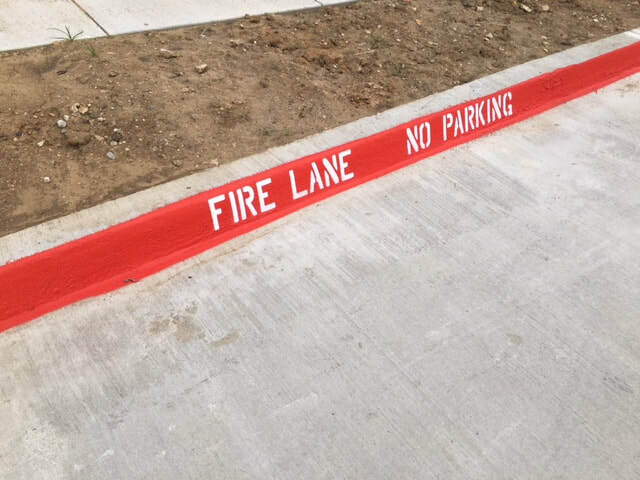 We will provide the red striping and the white stenciling of “NO PARKING FIRE LANE” as required for all fire lane striping that we provide. Maintaining handicap accessible compliance is very important for every business owner. You must comply with The American Disabilities Act of 1990 regarding the number of handicap parking spaces that must be present in your parking lot. The rules are very specific and a number of handicap stalls that must be available are based on the current size of your parking lot, and the amount of parking spaces that you have available for every 1,000 square feet. There are other rules that go along with this, but they are all very specific. 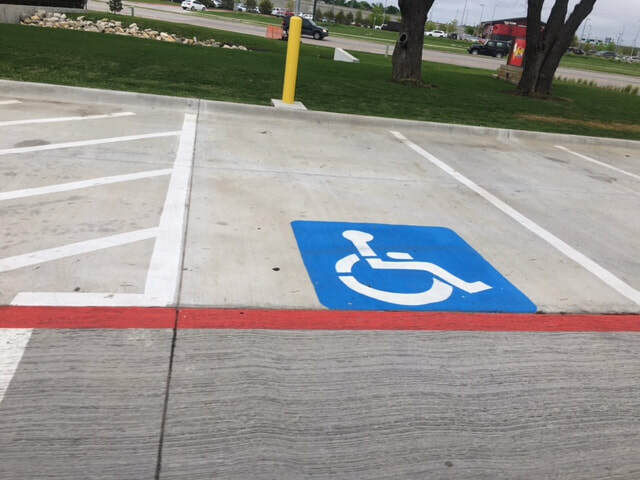 So do not worry about trying to keep up with all these rules, as we know them, and will make sure that your parking lot is fully ADA compliant with striping and handicap signs by the time we have finished striping. Wheel Stops have a few other names that you may have heard before. They may also be known as car stops, or parking blocks, and are generally installed in parking lots to prevent vehicles from causing damage your property. They can also be used as an alternative to curbing if necessary. Wheelstops come in a variety of materials which make it easy to fit into almost any budget. Wheel stops can take quite a bit of abuse from vehicle tires parking snugly against them, so you need to make sure you purchase wheelstops that best fit the traffic in your parking area. Concrete car stops will break easily if large trucks or 18-Wheelers are parking against them. If your parking area caters to large trucks you may want to consider steel wheel stops instead of concrete, or rubber. No matter your budget, or the types of wheel stops you purchase, we provide professional installation. We make sure your stops are properly installed to protect your investment, as well as be safe for pedestrians. Wheel stops are primarily installed as a safety feature to protect your property, however, if they are not properly installed, illuminated or painted, they will become a hazard for pedestrians. When installed properly wheelstops will be fully covered by the vehicle parking in the stall. When the space is occupied by a vehicle the tripping hazard is not present, however, when the space is not occupied, there is a risk of pedestrians tripping over these wheel stops if they cannot be easily seen. ​Vehicle and pedestrian safety is always the top priority for any business owner with a parking area. So many accidents can happen in the parking lot if safety measures are not put in place. Installing speed bumps will help control the traffic speed within your lot, thus resulting in fewer vehicle accidents. Speed bumps should be installed near crosswalks and any large stretch of pavement where speeds can be increased in the lot. 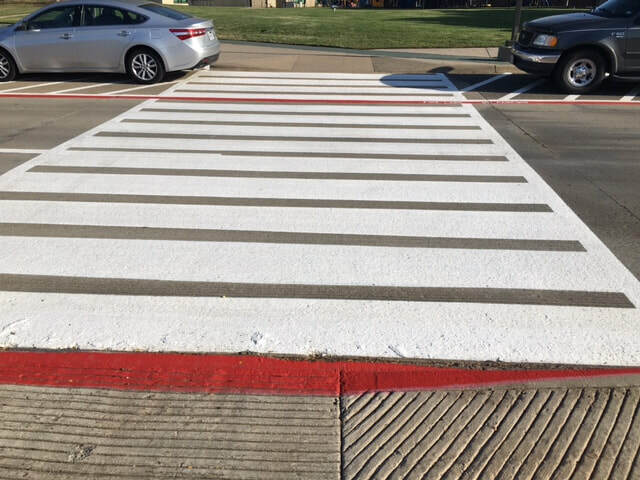 You will want to make sure the speed bumps are very noticeable and brightly colored with reflective paint so that drivers will see them and slow down before hitting them at a high rate of speed, and also so pedestrians also see them and do not trip over the hump. Speed bumps can be made of out many types of materials, but the most common you will see are asphalt, rubber, or concrete. Proper painting and maintenance to these speed bumps will help prolong the life expectancy as these do take a beating from cars running over them daily. Our professional installers will be able to properly install or remove speed bumps in your parking area. Asphalt parking lot surfaces must be well maintained, otherwise, they will soon deteriorate and not last for very long. Adding a sealcoating to the top of your asphalt parking lot will provide an extra layer of protection that will make the parking lot last for a long time. It is advised that within the first year of installing your asphalt parking lot, you should have a sealcoating applied. After that time, applying the sealcoat every 2-3 years is advised. The seal coat is a top layer of protection that will seal small cracks and also weatherproof the surface. Without the weatherproofing water will seep through the cracks down to the base, causing oxidation and deterioration resulting in horrible damage to the asphalt. If you have larger cracks in the asphalt, those will need to be repaired prior to adding the sealcoat. The seal coating also acts now as the wearable surface, meaning that when vehicles drive on the surface and their wheels turn and wear down the surface, known as abrasion, this wearing down will be of the sealcoat surface and not the actual asphalt. This protection means your actual asphalt surface will last a long time. The best news is that once the sealcoat is applied, the deep dark coloring will make your parking lot look brand new. Add a fresh striping job on top of this, and the outcome will look amazing. You will love it, and will also be protecting and prolonging the life of your parking lot for a long time. Local business owners in Oklahoma City know the importance of maintaining an excellent appearance. Our goal is to make you a life-long customer and help you regularly maintain your striping by giving your lot a fresh coat of paint. We know that when your business exterior looks good it attracts more customers to come in and spend money. When it comes to pricing, you will find that we have the most competitive prices in Oklahoma City. Our goal is to not only provide you with the best price in the city but also to make you a life-long customer. We will gladly provide you with a FREE quote detailing every aspect of your parking lot striping project. Give us a call today and we will schedule a time to come out to your property and determine what is needed to get your parking lot striped and compliant again. Once we have gathered all of this information we can email you or call you back with the pricing. We know you will love our pricing and we look forward to working with you very soon.